We’ve been in a constant state of remodel here at the tiny white cottage. So much so that I have been without a kitchen table for the past five months. Since then all of my photo’s for this humble little blog have been taken on a cutting board on my counter top. I could have lost steam and inspiration for lack of space (and light for that matter) but for some reason I have been chugging along like the ‘little engine that could’. I certainly haven’t lost enthusiasm for cooking dinner for the guys and some of my best meals have transpired in this construction zone. 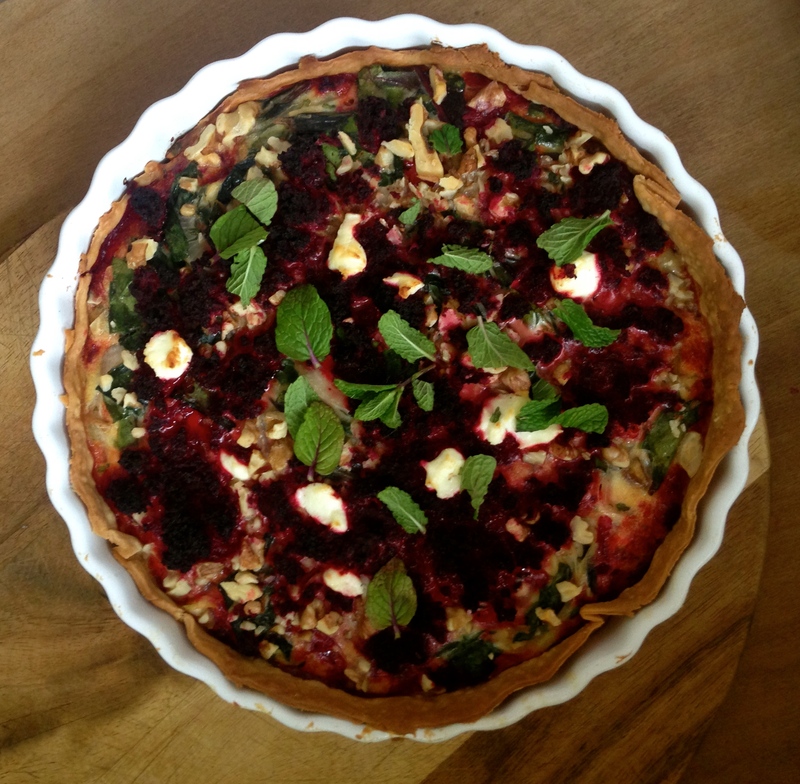 Like for instance, this beet, goat’s cheese & walnut tart. It doesn’t take a kitchen table to bring us together for a nice meal in the evening. We are happy to sit down on stools or chairs or even hop up on the kitchen counter with a plate and fork in hand. It’s such a valuable time of day, and to be able to take three lovely organic beets with the greens attached and create a delicious tart such as this calls for a moment to sit and sigh in relief that all is well and wonderful. I stumbled upon this recipe a couple of weeks ago on Epicurious and couldn’t get to the market quick enough to pick up beets and goat’s cheese. If you love beet, goat cheese & walnut salad you’ll love this pie. Sometimes beets with the greens attached are not available at the market. If this is true at your market you may use another tender green such as spinach or chard. Preheat oven to 350°F. Peel and grate the beets using a box grater or food processor. Place a large skillet on medium heat. Add olive oil or coconut oil and spread onion slices evenly in the pan. Fry for five minutes each side. Add garlic and thyme and cook until fragrant. Toss in 1/2 of the beet greens (or spinach) with apple cider vinegar, salt and pepper. When the greens are wilted stir in the other half and remove the skillet off the heat. Beat the eggs together with the milk and then crumble in the goat’s cheese. Add the eggs and cheese to the greens and onion mixture and combine well. Stir in the mint leaves and set aside. After rolling out your pie dough transfer it to your pie pan. Prick the bottom a few time and blind bake for 10 minutes. Arrange the grated beets at the bottom of the pie and keep a little for the top. Pour the egg and greens mixture onto the crust, making sure that the cheese is evenly distributed. Spread the walnut pieces here and there on the top and sprinkle the remaining shredded beets. Bake for 30-35 minutes or until golden and set. 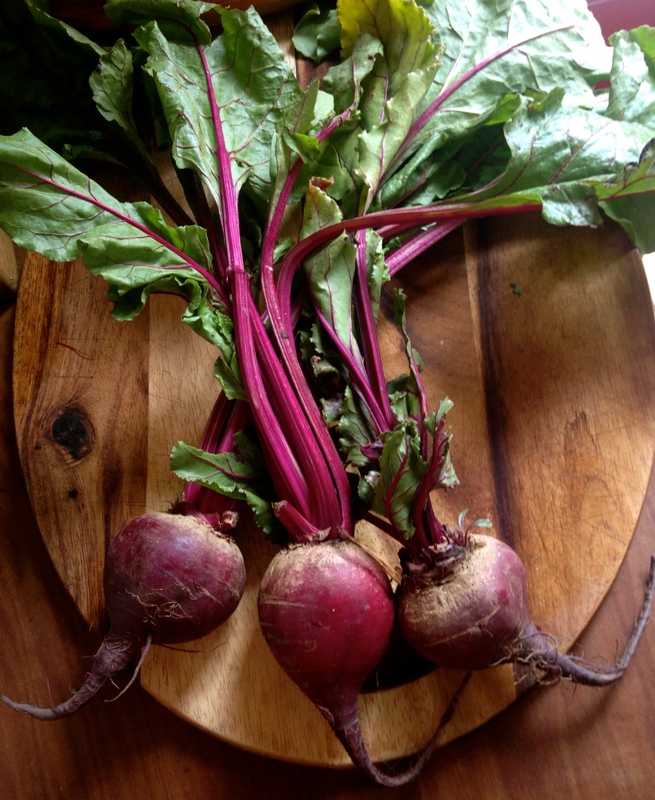 You are currently browsing entries tagged with beet at COTTAGE GROVE HOUSE.